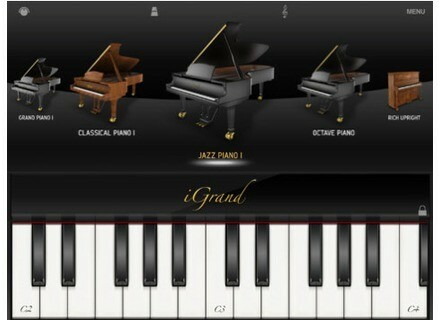 iGrand Piano, Virtual instrument for iPhone / iPod Touch / iPad from IK Multimedia. 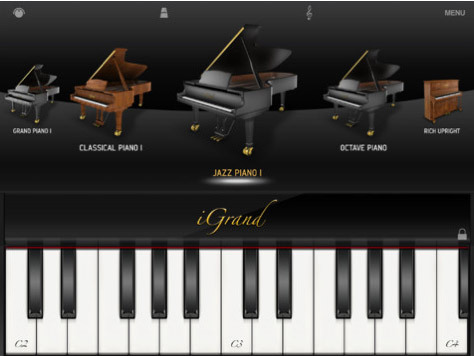 IK Multimedia announces the release of iGrand Piano for iPhone and iPod touch, an app, offering 17 stereo pianos. The app's graphics are native to iPhone 4, iPhone 5,and the new iPod touch, meaning that its display utilizes the full screen size of the new devices, but is also suited for previous models. iGrand Piano for iPhone and iPod touch provides the same features, sound quality and piano lineup as the recently released iGrand Piano for iPad. Users get a virtual gallery of pianos including grands, baby grands, uprights, and specialty pianos. The app includes a collection of 8 pianos, which can be expanded up to 17 via in-app purchase. The pianos get their sound from stereo samples, recorded across multiple velocities. iGrand Piano offers polyphony (up to 64 notes can be played simultaneously on the latest devices). Each of iGrand Piano's instruments can be adjusted with seven performance parameters. These include Volume, Ambience, Lid (positioning), Brightness, Transpose, Tuning and Release. The parameters can be assigned to a MIDI controller number for external control. In addition, iGrand Piano supports MIDI program change and Virtual MIDI. Besides its piano sounds, the app has a built-in recorder, which offers overdubbing; quantizing; and audio file export using file sharing, e-mail and the copy function. Also included is a large audio/visual metronome with a tap tempo function. The app provides two different views for onscreen playing, but iGrand Piano for iPhone can be best used with an external keyboard, according to the company. IK offers two options in this regard: iRig MIDI lets you connect a MIDI keyboard to your iPhone, iPad or iPod touch, and control Core MIDI apps; and the new iRig KEYS, a portable, 37 mini-key controller, is compatible with Apple's mobile devices as well as Mac/PC; and is bus powered on both platforms. iGrand Piano is available for $19.99/€17.99 from the App Store at www.itunes.com/appstore. Toontrack Rock Solid EZX Toontrack has announced the release of Rock Solid EZX, a collection of drums suited for classic rock or modern metal. StepPolyArp v2.0 StepPolyArp for iPad has been updated to 2.0.